Dandelions, dandelions everywhere! The City has reduced its herbicide use over the past few years, which is a very good thing – dandelions are, after all, one of the best early pollinator plants around! The name dandelion comes from the French “dent de lion” – lion’s tooth, which refers to the serrated leaves. Another folk name for dandelion is “swine snort,” which makes me want to sneeze or giggle or both. Taraxacum officinale is a perennial, but there are some dandelion species that are biennial. Dandelion pollen cannot cause allergies – the grains are far too large to be bothersome, but you can get contact dermatitis from the milky sap (latex) that the plant contains. Dandelions open in the daytime and close at night. Dandelion seed can travel up to 8 kilometres (5 miles). Dandelion flower heads can be used to make dye in the yellow-green range. The leaves will make a purple dye. Dandelions will produce more seed than usual if their habitat is disturbed, giving them a competitive edge over other plants in the area. Dandelions have a taproot which can extend up to a whopping 4.5 metres (15 feet) underground, although you’ll typically find them top out at 45 cm (18″), which is still pretty long. The taproot of dandelions is very useful to reduce compaction in garden soil. Dandelions are dynamic accumulators – that means they can draw nutrients such as nitrogen from the soil and concentrate them in their leaves and roots. The parts of the dandelion apparently represent the celestial bodies: the yellow flower head is the sun, the white seed head is the moon, and the seeds are the stars as they spread all over the galaxy (read: your lawn). What we think of as the petals of a dandelion flower are actually individual flowers themselves. They will produce fruit called achenes, followed by the tiny, barbed brown seed and it’s accompanying “parachute” (called a pappus) that helps it disperse in the wind. Dandelion flowers do not need pollinators to form seed – they can pollinate themselves. Dandelions likely originated in Eurasia 30 million years ago. Dandelions are known as ruderals or pioneer plants, the first to colonize disturbed land (such as after a wildfire). Dandelion blossoms have been historically used to treat warts, clear skin complexion, and heal blisters. I read that there is some sort of idea to use the latex in the future to make rubber tires for automobiles – we’ll see how that turns out. UPDATE: There is an article about the concept here. Dandelion roots can be used as a coffee substitute, much like chicory. I had no idea, but dandelion roots can also be used to make beer – here is one recipe I found, which also uses burdock roots. Dandelion leaves are rich in vitamins A, C, and K, and the minerals calcium, potassium, iron, and manganese. Some children’s books (fiction and non-fiction) about dandelions include: Joseph P. Anthony’s The Dandelion Seed, L. Kite’s Dandelion Adventures, and two sets of books with the same title, From Seed to Dandelion, by Jan Kottke and Ellen Weiss, and Dandelions, by Kathleen Kudlinski and Eve Bunting. I reviewed Kevin Sheehan’s The Dandelion’s Tale a few years ago on my now-defunct blog The Door is Ajar – you can find my thoughts here. Did you know there is a dandelion tree? Well, not really…it’s another case of the utter inaccuracy of most common names. Despite this, Dendroseris pruinata is fascinating and rare, and you can take a look at some photos of it here. According to the Guinness Book of World Records, the world’s tallest dandelion was grown here in Canada (in Ontario), and was found in September of 2011. It topped out at a whopping 177.8 cm (70 inches). Apparently, there have been at least two (maybe three?) record-breaking dandelions grown since then, but there is some dispute over whether any of them – even the record-holder – are actually dandelions at all. Read all about the controversy here! (This one in Norfolk certainly seems a little suspicious…). I found this strange dandelion specimen this morning out on Nose Hill – it looks like it might be a type of fasciation. The fifth flower head actually drove through the centre stem, which was massively enlarged and already sported four joined flower heads. This entry was posted in Botany, Flower, Food, Gardening, Horticulture, Nature, Outdoors, Photography, Plant, Weed and tagged Calgary, Dandelion, Fasciation, Interesting Facts about Dandelions, Pollinator plant, Taraxacum officinale. Bookmark the permalink. ← The don’ts of bird photography. Thanks so much for the fun post! I love learning new things……Dandelions are far from useless weeds! My mother used to pick the greens before the plant had blossoms and cook them with salt pork. They were a bit bitter but, I remember loving the idea that we picked them from the yard and were eating them. My best friend’s father, who was Swedish, made Dandelion wine which we helped ourselves to when we were teens and added water to the bottles! I love that reminiscence about the dandelion wine! 🙂 I think it is wonderful that you realized even as a child that there was something special about eating the greens grown in the yard. Some interesting things there! 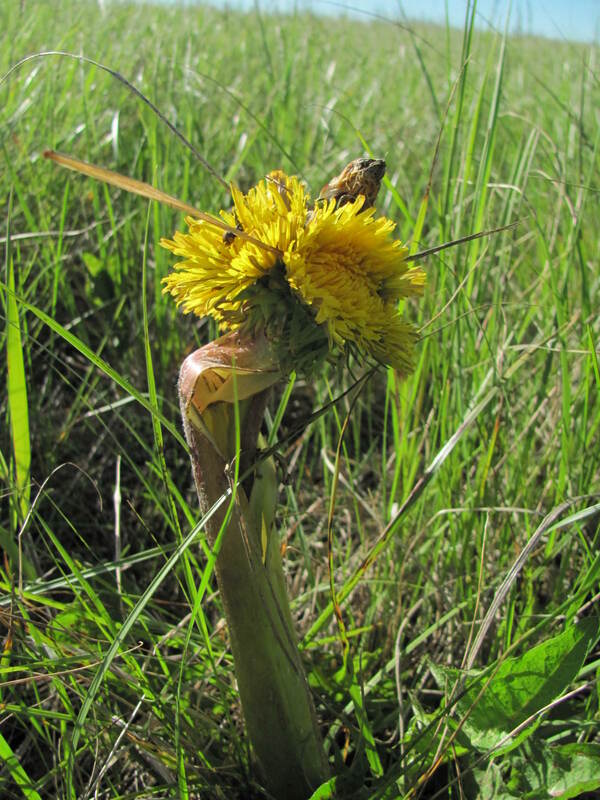 The fact that dandelions are apomictic – produce seed without pollination – explains why there is so little variation in the flowers, though leaf shape does vary. There is at least one taraxacum species that has pink flowers, however, and I had it once but it died! Not much of an achievement for a gardener – not being able to grow dandelions! I often think that if dandelions were difficult to grow we would all want them – they are so beautiful. I have made wine from the flowers and have eaten the leaves (they are better after blanching – putting a light-proof pot over them so you have pale tender leaves) and made coffee from the roots – which is pleasant but not much like coffee! You can also make dandelion honey from the flowers – boiling them in sugar syrup and reducing it down to a brown, sticky syrup. I am pretty sure that it was the Russians who experimented with using the latex to make rubber. I love that – “if dandelions were difficult to grow we would all want them.” So true! Maybe we are suffering from a bit of a dandelion overload! 🙂 But they are definitely beautiful and very useful. Thanks so much for sharing all this wonderful information! So fun to read al these facts! We have tons of dandelions growing in our yard! I think the facts are interesting and it seems that people are a bit more tolerant of these flowers these days. I love the little blighters. They are so cheerful and bright and always the first flowers in bloom after a long, cold winter. Also, they make wonderful food for bees – at the very least the bees around here seem to love them. I’m terrible about digging them out of my garden beds unless I need the space for another plant. Dandelion jelly tastes like honey but, alas, I’m not making a batch this year. Too many things to process in the pressure canner!! I LOVED the flavour of the dandelion jelly you made…you’re right, it does taste like honey. So yummy! There are some interesting facts there… don’t like the sound of those long tap roots though! We have firlds full of them near our garden, so there is no pint in worrying about the seed as it will inevitably germinate everywhere! We just enjoy the colourful meadows in spring. I have used the leaves in salads and the flowers in bread, but they didn’t really add any flavour! What a great idea to use the flowers in bread – that’s too bad they didn’t offer anything extra in the way of flavour! I would have thought otherwise…interesting. What a very strange dandelion in your last photo. I wonder if it has extra roots as well? I wonder as well…it was very interesting to see. I’ve seen fasciated dandelions where the flower heads were elongated and melded together but never like this. It´s interesting to read about the name. In German we call it “Löwenzahn”, which also means Lion´s tooth. But it sounds very different from the French “dent de Lion”. That is interesting! I love the sound of the German word. I guess the English dandelion is an approximated phonetic version of the French phrase. Yes, the French and English names sound very similar. Another Lion plant came into my mind. What you call snapdragon (Antihirrhinum) is called in German “Löwenmäulchen” ~ Lion´s little mouth. I like this kind of fact-filled post about a plant so common we take it for granted! I, too, have fond memories of homemade dandelion wine from my teenage years . . .
Dandelions can be whatever you choose them to be between food for your body or irritation to your soul. I choose to think of them as yellow flowers from above that come early for the native pollinators to enjoy. This year with our very cold spring, the dandelions were more useful than usual to the bees – there just wasn’t much else blooming early on. Definitely very valuable plants for pollinators! Dandelion & Burdock is a traditional soft drink in the UK. So interesting! I am curious as to the taste…. I tend toward the “bane of my existence” camp, but I agree that they are of nutritional value. Thank you for the info. A 15 ft tap root is mind boggling! They are definitely a health food, that’s for sure! But sometimes they just get to be too much to handle in the garden…. The factoid about deep tape roots, breaking up compacted ground & pulling up nutrients (same applies to other deep root plants such as thistles and queen-anne’s lace) is one reason I leave them be where we live. Our Appalanchian Mountion region is mostly shale & sandstone. Anything that will create better soil is good to me. I do mow the flower stocks along the pathways, to leave the roots, but limit the seed production. Dandelions can be incredibly useful in the garden! I’m very happy to hear that you’re utilizing them to help your soil quality – it’s something we should think of doing here as well. Must admit I’m a dandelion lover but I live out in the country where dandelions can roam free. I find them relatively easy to remove from garden beds compared to some of the really invasive weeds that spread by roots. As a kid we used to pick the leaves for salads. I haven’t done that in years but perhaps I’ll give it a try one of these days. I remember the taste was actually quite nice. I agree – that taproot isn’t as tricky to remove as, say, the impressively lengthy roots of quackgrass (which is the bane of MY existence). I think the leaves would be delicious in a mixed green salad! Sheryl somewhere I lost the feed to your blog and just discovered that so I have signed up again….we do love to eat them, but they can be such a pain in the garden because they can take over…of course the vacant house next door with the 2 foot high lawn of weeds does not help. I think that’s often a problem in urban areas – the neighbours not keeping up with the weeds/lawn. It can make things very tricky for the homeowner who wants to keep a bit of control over their garden and yard. There’s a point where it can really get to be too much. Your first photo is so beautiful of this under-appreciated plant. I enjoyed reading about this ‘weed’. Why is it so hard to work with what’s around us? Why not a field of golden daffodils and dandelions? I wonder if they are ever planted on purpose? Thanks for the post! Thank you! That’s so true…we don’t always have to control everything around us! That brilliant yellow is so appreciated in the spring. I wonder as well if anyone plants dandelions in their veggie garden as a food crop. Love dandelions and love this post;0) Dandelions have lots vit. C and are very tasty. I put the young green leaves in salads, just a handful. Nice with hard boil eggs too. Or when you see a plant growing, put a terra cotta flowerpot upside down on top, the leaves will turn whitish and are also delicious and are known as ‘mole lettuce’. Young flowers I harvest too. I fry them for about 2 minutes and than pour pancake batter on it…ohohohoh, with a little maple syrup, the best you have ever tasted. And I did not know about the mole lettuce until I received a couple of comments about it. So interesting! I imagine it sweetens the flavour of the leaves as well. I wonder why it’s not working as it should…hopefully you’ll soon have success with it. It’s an excellent idea! Hey LB, fancy meeting you here, tehe. Hey, they rarely even spoke to us and not once thanked us for mowing their weeds, so they are surely missing our sorry butts, LOL. Love that Karma thang sometimes. A little slice of, “Guess what, it’s you NOT me”. lolololol. I think most people would be tempted to go with the weed notice! You and your hubby were such good neighbours…I can’t believe they didn’t thank you for doing the work. Yep, as you say…karma! I’m kind of in the middle … no real problems. The facts that you posted were interesting! Especially the part about being pioneer plants. I thought that part was rather interesting as well; I had not known that before. Incredibly useful plants! This has really changed my opinion of them. It’s true…and especially here, when our spring weather is often incredibly cold and there really aren’t any other food sources available. After watching the bees this spring, I’ve decided to plant more early spring bulbs like muscari to offer up some extra options in my garden. Thanks so much for posting the link as well – a good read! That’s a great idea, too. You’ve given me lots of food for thought. Hey, let me know if you get around to making that beer! I really enjoyed the compilation of random facts about dandelions……..I can attest to the truth of length of the tap root………..
LOL yes those tap roots can be impressive…. I was just thinking, it won’t be too long until we see the yellow flowers popping up everywhere. I wasn’t sure I was going to find time to reply. I spent so much of it reading all the comments about dandelions. This was a lot of great information! I know about how deep the roots go and if you don’t dig them out, they just grow somewhere else. I really don’t mind them as they serve a purpose. Nature abhors a vacuum and a dandelion is always happy to fill it. They are good for keeping soil from eroding and for the bees so my neighbors will just have to get over themselves when they see one in my yard. They call the weed police around here too. I figure mother nature knows what she’s doing. They use the greens down in the south a lot. I’ve never been much of a cooked greens eater myself but when the world gets hungry, those weeds might look a little different to us. Thank you for all the research and enlightenment. I love learning new things. Very interesting facts, I’v learned a lot ! I love these flowers, especially their shape. And thank you so much for following Flowery Prose! I’m happy to have found your blog – your photos are fantastic. The thing I notice about the seeds blowing around !! Is when they land ! They know how to maouvere ,,, crawl & roll around ,, they know how to navagate and use the wind to get around !!! Dunno how they do this !! But watch em long enough ,,, and they are not simply getting blowin around !! They can fly when it suits them !! The got some intelligence if you got time to watch em !!! Hope some one else can see this ?? Am I right ? An interesting observation! I have to spend a bit more time watching them next year…now you’ve got me curious! What interesting facts about ole yeller! I hate dandelions cause they’re everywhere. I’m sure if they were limited and hard to find…I’d like them. They are a pretty yellow. Nope….can’t wrap my head around liking them. Had no idea all these facts existed! Thanks for assembling and posting them. I’m so pleased you enjoyed this post! It was fun to research and write. I love this post about one of the most colourful and useful inhabitants of the natural world. Thanx Sheryl! Great post – we keep our dandelions and our milk weed and most other flowering weeds (except bind weed – always comes back and tries to strangle the life out of my veggies – grrr LOL). We have lots of bees and butterflies and want to keep feeding them so they come back. They are the bane of my existence. I tried putting the yellow heads on a salad and it looked pretty but by the time I served the green salad….the dandelion heads had closed and the salad looked pitiful. Thanks for the, like, on, The Apprehensive Blue Jay, at Elm Drive Images. Thanks for, liking, my, Orang Sky at Dusk, Sheryl. Always appreciate your continuing interest in Elm Drive Images. Thanks for your like on my, Early Mornimg Light, at, Elm Drive Images. Sheryl: Great captures and excellent info … thanks for the, like, on, Muffin playing with tie wraps a on our deck chair. Good point! Definitely an error in how that statement is written – thanks for mentioning it! Thank you! I’m so delighted to have found your blog!